Dr. Jarred of Lone Mountain Animal Hospital explains the origins of Pit Bulls including common misconceptions of the breed. So what exactly is a Pit Bull? Four breeds commonly identified as pit bulls. Pit Bulls were not always so feared by the media or the public, and in 1914-1918 were deemed “America’s dog” and used in World War I to sell war bonds and recruit for the US military. Where did this negative image of the Pit Bull come from? In 1987, a sports illustrated article was written deeming the Pit Bull a “vicious animal” – citing numerous human attacks, referencing their supposed extreme aggression, and inability to be integrated into society. 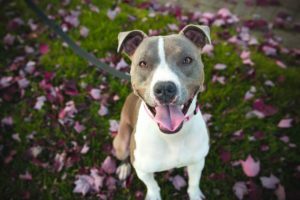 Taking any emotions you have about this breed out of the equation – if you look at the actual statistics Pit Bulls are not more dangerous than many other large dog breeds. – There is no such thing as “locking jaws of pitbulls”. Pit-Bull jaws are anatomically the same as any other breed of dog. A study was done that showed the average pit bull jaw exerts 235 pounds per square inch, compared to the average for all dogs which is 320 pounds per square inch. – Peer-reviewed statistics conclude that 72% of dog-bite related fatalities were caused by non-pitbull type breeds and mixed-breeds and only ​28% were attributed to all 4 pitbull-type breeds combined. – Peer-reviewed statistics conclude that 72% of dog-bite related fatalities were caused by non-pitbull type breeds and mixed-breeds and only ​28% were attributed to all 4 pitbull-type breeds combined. – In 2016 the American Temperament Testing Society found that 87% (out of over 900 dogs) of Pit Bulls passed their temperament test. This is shockingly higher than many other popular breeds like the Collie (58%), Golden Retriever (85%), or Olde English Sheepdog (77%). Police departments across the country have begun adopting Pit Bulls to become police dogs, A job normally reserved for German Shepherds. Traditional breeds can cost The Police department up to 15K per dog. Officers have begun scouting local shelters seeking Pit Bulls with potential for adoption and proper training. While the influence of genetics on certain aspects of a dog’s personality cannot be denied, deeming an entire group of dogs inherently dangerous is simply unfair. This is directly related to the high numbers of pit bulls being admitted to, and euthanized in animal shelters across the country. These are family oriented, loyal, energetic dogs that with proper exercise and training (like any dog) make wonderful companions. I urge my clients to be responsible owners, regardless of breed, and consider facts versus fiction when choosing the right dog breed for you and your family. Thank you! I hope that this article is widely published. I have had 2 rescued pitbulls. Neither has shown any human agression, both have lived peacefully with a mixed household of dogs, a cat, chickens and horses. They have been loving and loyal to my 5 year old granddaughter! Their biggest danger is they are so social they need human contact more than any other breed I have had in my 64 years. Both dogs were thrown away. My new one was literally thrown out of a car on a highway in Texas with his 2 sisters as little puppies. I have a great deal of exposure to dogs, and the most vicious I have encountered was a Black lab cross who I never saw coming, and vicious attacked me in 3 separate bites the last requiring a trip to the ER and extensive (over 30) stitches. It is not the breed but the way the dogs are treated and raised.